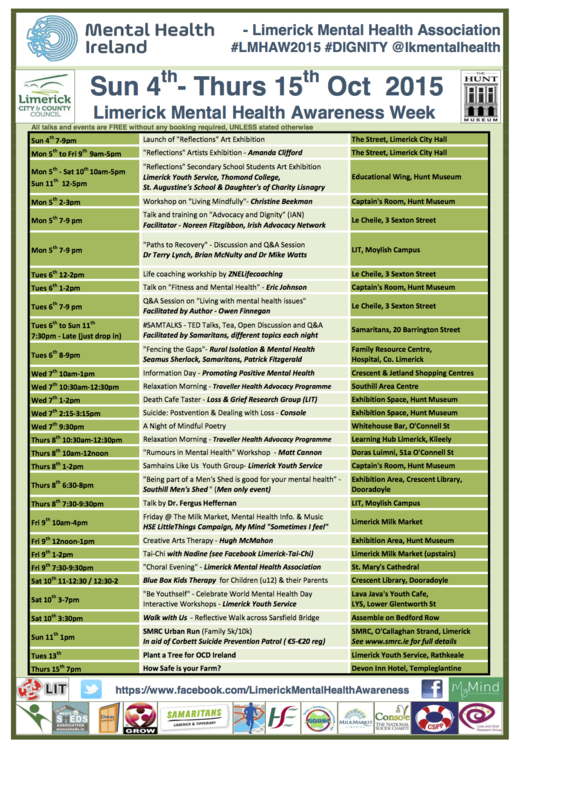 Limerick Mental Health Week 2015 worked with many mental health associations to have a successful week full of events to promote positive mental health. Limerick Mental Health Week 2015 Launch included Michelle O’Connor, MyMind, Bernadette Kenny, Bluebox creative art therapy, Patrick Fitzgerald, Ichas, John Downey, Samaritans, Siobhan Wilmott, Limerick Youth Service, Amanda Clifford, Limerick Mental Health Association, Jennifer Moran Strich, LIT, Jennifer Mc Mahon, Limerick Mental Health Association, Claire Flynn, Le Cheile and Rob Stephen of GROW. To coincide with World Mental Health Day on October 10th, Limerick Mental Health Week planned a range of informative, thought-provoking and fun events which were run across the city from October 4th to October 11th. The timetable included: A series of public talks, exhibitions, workshops and events. The aim of Mental Health Week is to raise awareness of mental health in the local community, to promote positive mental health and well-being.